July 12, 2015. The Times of India reports that despite being on the brink of extinction, dugongs are being hunted illegally in Indian waters, where less than 250 animals remain. The Indian government is taking steps to seize and jail the poachers, but the dugong population is already at such a critically low level that it is unlikely it will recover. Dugongs only reproduce every 6 to 10 years when conditions are optimal (food and mating pairs are available). 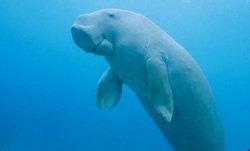 Dugong mothers give birth to only one baby and spend the next six years nursing and nurturing their young. QUEENSLAND TREASURY DECLARES ADANI MEGA COAL MINE AND PORT "UNBANKABLE"
June 30, 2015. The Sydney Morning Herald reported that the Queensland Treasury declared Adani Corporation's plans for the Carmichael mine and the expansion of the mega coal port at Abbott Point "unbankable" Since the Spring of 2014, all major banks backing the project, including Deutsche Bank and HSBC, have dropped their support amid worldwide outrage against Adani and its plans to dredge 10 million tons of seabed in the Great Barrier Reef World Heritage Area, in order to allow giant coal tanker ships to pass and reach the Abbott Point coal terminal. June 23, 2015. On Tuesday, the Guardian and other major news agencies reported that the coal mining corporation Adani has stopped engineering projects for the expansion of Abbot Point, the mega port expansion at the center of the worldwide outrage against dredging and dumping in the Great Barrier Reef World Heritage area. This is a hopeful sign in the fight to restore the Great Barrier Reef to its pristine condition, as a unique habitat for endangered dugongs and 6000 other animal species. This news arrives only a few days before the United Nations' meeting, scheduled for June 28, where the UN will decide whether to declare the Great Barrier Reef "endangered" (on the so-called "Shame List"), due to the continuing deterioration of the state of this unique marine eco-system. April 2015. Professors Terry P. Hughes, John C. Day and John Brody, of James Cook University, published a groundbreaking study in the prestigious journal Nature, calling for the Australian government to take immediate steps to save the Great Barrier Reef. The authors emphasize the destructive effects of climate change, dredging, coastal development for coal ports and industrial fishing on the World Heritage Site. The Great Barrier Reef is home to several endangered species, including one the last sustainable population of dugongs in the world. Despite their endangered status, dugongs are legally hunted in Australia by the thousands every year, along with endangered green turtles also harvested by the tens of thousands. The article outlines serious and feasible guidelines for restoring the Great Barrier Reef to its pristine condition. First and foremost, the authors argue that all dumping of dredge spoil or any other material should be prohibited in all reef waters, a position held by many conservation organizations, including WWF, Greenpeace and SaveTheDugong.org, as highlighted by the worldwide efforts in 2014, culminating in the submission of our signatures and petition to the UNESCO meeting at Doha (June 2014). There is no compromise or reason for delay. The Great Barrier Reef is the largest living structure on Earth, home to more than 10,000 animal species, many of them only found in this unique environment, and several of them on the brink of extinction. On Dec. 29, 2014, Yowan Nalo, a fisherman on the island of Malekula (Vanuatu), freed a baby dugong from fishing gear, according to an article by the Vanuatu Daily Post (Jan. 6, 2015, see photo). 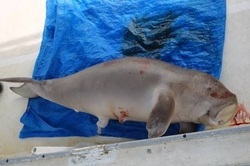 Some villagers reportedly intended to keep the dugong tied to a rope, as a tourist attraction, but Nalo freed the calf. Fishing gear represents a severe threat to endangered dugongs. Especially abandoned nets and gill nets often cause dugongs to become entangled and drown. Unlike other marine mammals, such as orca, dolphins or whales, dugongs can only dive for up to 6 minutes. Therefore, dugongs have much less time to try and free themselves from fishing nets and other abandoned fishing equipment, if they become entangled. Moreover, it is absolutely paramount for governments to educate the public on the declining numbers of this species, and their extremely delicate life cycle. Dugongs cannot be kept as pets or confined to small spaces. Adults require more than 40 Kg of fresh sea grass per day, which cannot be provided by any human caretaker. Dugong calves require 6+ years of nurturing care from their mothers in order to function properly within their habitats, learning how to forage, communicate and evade threats. The Vanuatu fisherman, Yowan Nalo, is a commendable example of a conscientious person who acted according to solid information, common sense and compassion. We hope that others may take his actions as an example in Vanuatu and throughout the dugong's habitat. On Dec. 8, 2014 ABC reported that an old age home on Thursday Island, Australia, issued an invitation for a holiday dinner serving meat from endangered dugongs and turtles on their menu, for a $5 fee. This is in clear violation of the Native Title Act (section 211) which still allows hunting of endangered dugongs in Australia as long as the meat is not sold and used for purposes of subsistence. There has been no outcry from officials, despite the blatant disregard even for the outdated federal law. SPEARED DUGONG SWIMS TO RAMP OF SOLOMON ISLANDS MINISTRY OF FISHERIES AND DIES THERE. On Nov. 7, 2014, the Solomon Star newspaper reported this story, which is almost too abhorrent and preposterous to believe. It is confirmed, however, and the Solomon Star is the Solomon Islands' major newspaper. They have photographic evidence. According to the UN's Dugong Status Report and local sources, dugong hunting is legal and continues to be practiced in the Solomon Islands, despite dugongs' endangered, red listed status. Just last August, the Solomon Islands were even among the countries that received hefty $6 million grant for dugong conservation from Global Environment Facility, led by UNEP. What a way to show the country's commitment to dugong conservation. ABC reported on Saturday, Sept. 27, 2014 that the Australian government announced the allocation of $5 million AUS for a protection plan to stop and prosecute the illegal trade and poaching of dugong and turtle meat. The efforts will be led by the Federal Police (AFP), Customs and Border Protection and the Australian Crime Commission. This is the most significant step toward limiting the brutal killing of endangered dugongs in decades. This protection plan does not change Australian law, which still allows the hunting of endangered dugongs throughout the country, without limits or seasons. Our efforts to reach a complete ban on this brutal, senseless and unsustainable practice will continue. However, it is critical to recognize, at this stage, the momentous importance of this step, a step in the right direction and one which is due in large part to the selfless efforts of ocean conservationists, and most of all their, our, supporters. Aug. 26, 2014 Conservationist Colin Riddell, of Bob Irwin Wildlife, speaks to News.com and NTNews, highlighting the hypocrisy of accusing Japan for whaling under the guise of "research" when government figures show that more than 1600 dugongs are brutally butchered in Australia every year. The government figures are based on estimates from hunters who actually report their kills; most hunters do not, and therefore the actual numbers of dugong deaths are much, much higher, indicating that extinction of this gentle, completely herbivorous animal is imminent. Aug. 15, 2014 The recent report from the Great Barrier Reef Marine Park Authority states that 97% of the dugongs that used to live in the park have disappeared. Considering the figures already published by the Australian Federal Government Wildlife and Fishing Survey, it is clear that unsustainable hunting is the reason behind the extinction event. AUSTRALIAN FEDERAL MP GEORGE CHRISTENSEN DECLARES HE "GOT IT WRONG" WHEN HE PUSHED FOR DUMPING 10 MILLION TONS OF DREDGE SPOIL ON THE GREAT BARRIER REEF. Aug. 27, 2014 Sadly, Christensen's revelation arrives weeks after the Federal Environment Minister Greg Hunt approved the dredging and dumping on the Great Barrier Reef, to make way for the expansion of gigantic coal ports in the United Nations World Heritage Area. 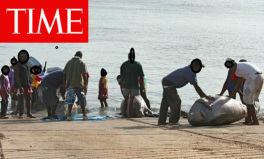 July 17, 2014 Article listing dugongs among five species facing imminent extinction, while the media, governments and even some environmental groups do nothing. The article does not mention that the greatest threat to dugong population is the legalized hunting of ENDANGERED dugongs throughout Australia, where the majority of these animals live. In the UAE, when a single endangered dugong dies, it's front page news. Dugongs are protected by federal law there, and Abu Dhabi allegedly has the second largest dugong population in the world (ca. 2000), after Australia. Dugongs are protected throughout the UAE and cherished by all. Only in Queensland, 2000 dugongs are hunted and brutally butchered every year; that's the entire dugong population of the UAE, every year! We don't even have official figures for the rest of Australia. And the Australian media and government don't make a peep. Why? 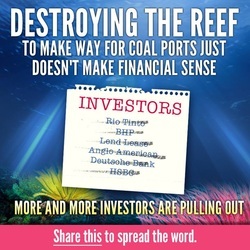 All major newspapers, including the Wall Street Journal and the Financial Times report that the Deutsche Bank refused to finance the dredging of the Great Barrier Reef, for the expansion of seven gigantic coal ports. THE GUARDIAN NEWSPAPER CALLS THREAT TO GREAT BARRIER REEF AND ENDANGERED WILDLIFE "UNPRECEDENTED"
Today (May 6, 2014) the famed international newspaper, The Guardian, featured a detailed article on the United Nations' and several experts' call for action to stop the dredging and dumping on the Great Barrier Reef. Previous dredging and dumping projects have caused mass strandings of endangered turtles and dugongs, and destroyed coral. 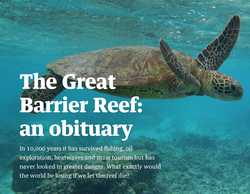 The oldest and one of the most trusted newspapers in Australia is calling the new so-called "Reef Facts" ads misleading, completely misrepresenting the effects of dredging on the Great Barrier Reef. This article comes in the wake of the United Nations' announcement that the Great Barrier Reef will be added to its "shame list" of endangered World Heritage Sites. The new ads are funded by the Australian Government (with taxpayers' money) AND the mining industries who are invested in the construction of seven gigantic coal ports on the Great Barrier Reef. The new ports will require extensive dredging of the sea floor and the dumping of at least 5 million tons of refuse on the Reef itself. Earlier this year, the Guardian reported that scientists called the "Reef Facts" government website "absolutely inaccurate" and a "political ploy." Dugongs are speared twice, tied to boats and drowned. Turtles are cut to pieces while still alive, bludgeoned on the head with rocks and bricks. Even though dugongs and turtles are protected, the hunting is legal under Native Title Act section 211, but the meat trade is absolutely illegal. UNESCO TO LIST GREAT BARRIER LIST AS ENDANGERED, ON "SHAME LIST"
Several news outlets, including the Guardian, the Huffington Post, the Irish Times and the Maritime Executive report that UNESCO, the United Nation's cultural and environmental organization, will list the Great Barrier Reef as officially "endangered" due to the Australian Government's fast tracking of gigantic dredging projects on the reef. The dredging is part of the plans for seven huge coal ports on this World Heritage Site. The dredging will destroy precious sea grass beds, the only food dugongs eat. The dredge spoil will be dumped on the Great Barrier Reef itself, one of the Seven Wonders of the World. Make your voice heard and ask the Australian Government to stop this madness. The Ecologist Magazine reports that the North Queensland Conservation Council is mounting a legal challenge to the Australian Government's decision to dredge the Great Barrier Reef and dump toxic dredge refuse on the reef itself. The dredging is part of the expansion of seven coal ports on the Queensland coast, and most notably the Abbot Point coal terminal, located only 70Km North East of the Whitsundays Islands National Park and Whitehaven beach, consistently rated one of the top three beaches in the world. James Cook University Legal Experts: "Dugong Hunting is Simply Cruel"
Dominique thiriet and Rebecca Smith, of James Cook University, demonstrate that the Australian law, allowing legal hunting of dugongs with harpoons, is cruel and unusual, not to mention in direct contrast with Australian policies and government statements against whaling. Current hunting practices allowed on the Northern coast of Australia involve harpooning the dugong, tying the creature to the boat, and dragging it by the tail until it drowns. The Dugong population in Palau consists of only a few hundred animals, and is the most isolated in the world. Despite a ban on hunting, poachers still hunt dugongs with spears and explosives. Local tribal leaders have stopped hunting completely and have become advocates against hunting, to ensure that future generations can enjoy seeing and swimming with dugongs. The Etpison museum and local government are championing an effort to preserve the remaining dugongs in Palau. The famed international newspaper discusses the threats that will end the Great Barrier Reef as we know it in a few years. Threats include: climate change, ocean acidification (from higher atmospheric Carbon Dioxide levels), crown of thorns starfish invasion (due to overfishing of its only predator, the triton shell), and most importantly, the dredging, dumping and pollution from coal industry and shipping activities. 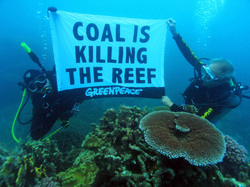 The coal port expansion at Abbot Point, in North Queensland, is featured prominently as the most destructive upcoming threat to the Reef. The Tears of a Dugong: A female dugong has been kept trapped for years, with her tail tied to a pole, so she can't escape. Her only purpose for the villagers in Kiat (Fakfak, Indonesia) and their chief, Bapak Duyung, is to be dragged on shore for the tourists to take pictures and pay a hefty $156 which the chief pockets. The photos in this news story show the poor creature crying, while immobile and dehydrated. Dugongs eat on average 80 Kg of sea grass per day, which requires them to move and search for new fields. Being tied to a pole makes it impossible for her to feed, so she's also starving.